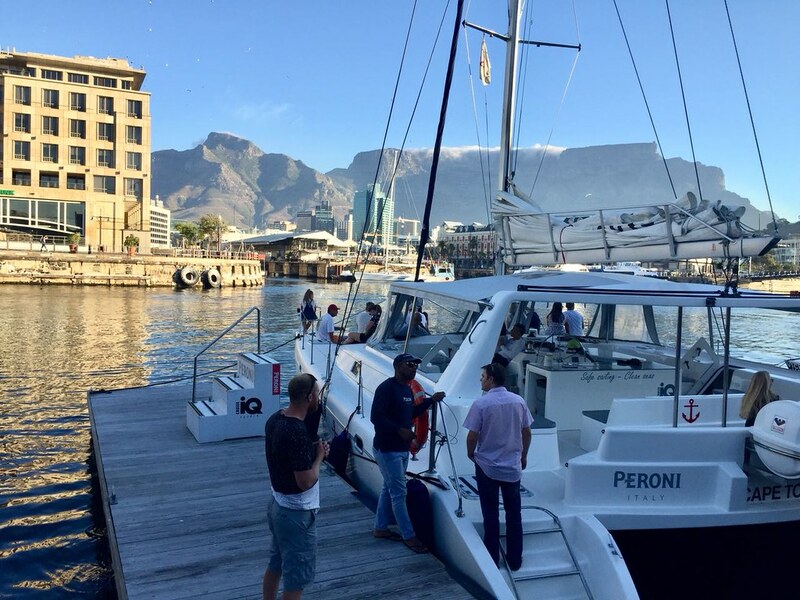 We have done a lot of fabulous things in Cape Town but I have to say that the sunset cruise on the iQ Perroni Catamaran we did at the weekend, is one of the top three experiences we’ve had since living in this spectacular city. We set off from the pier next to Mondiall restaurant in the Waterfront at 6:30pm with the mountain majestically towering behind the water and the beautiful Cape Grace hotel. The exit out of the harbour was slightly choppy as we went against the swell but as soon as we turned left out of the harbour it was a perfectly still ocean with a warm balmy evening breeze. 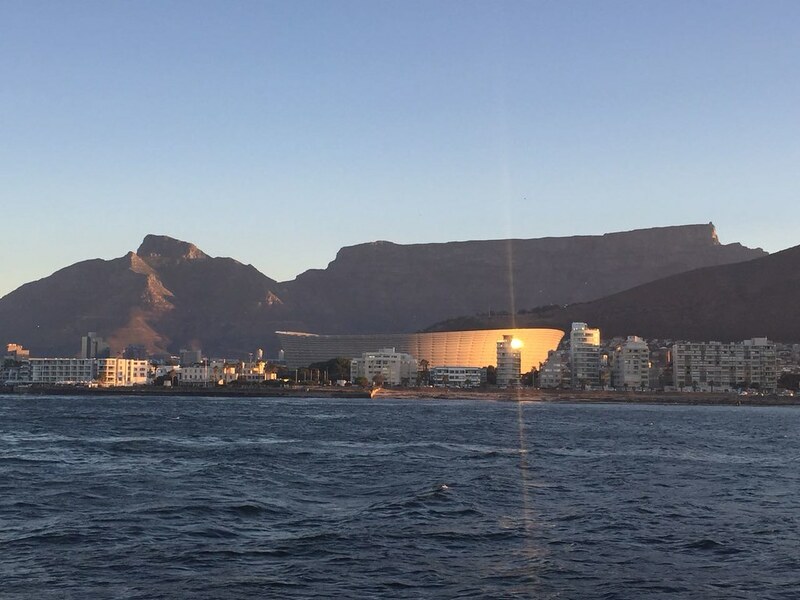 The view of the mountain, the city and the impressive Greenpoint stadium was absolutely breathtaking as it changed colour in the hues of the setting sun. Complimentary bubbly was flowing, the staff were friendly and helpful with taking photos and the music provided a fun atmosphere. 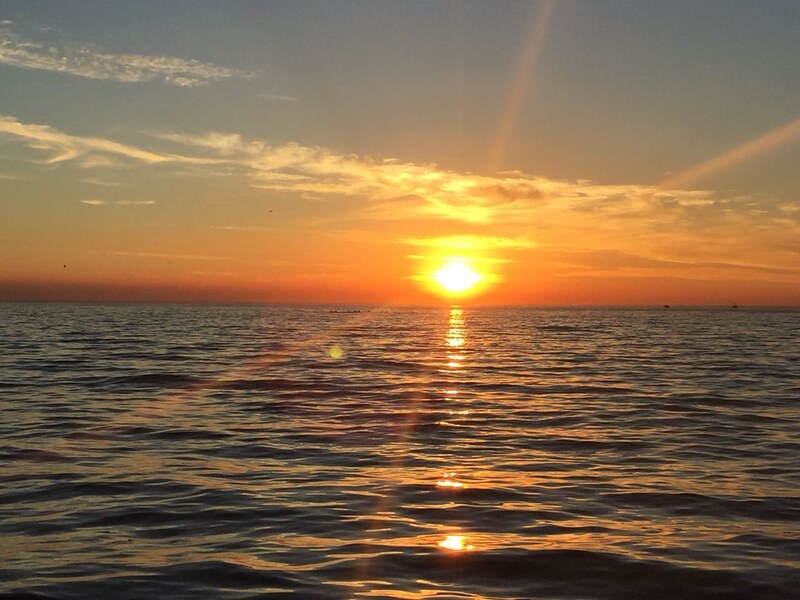 It was super romantic – my husband and I did this trip without the kids, so we sat at the front of the catamaran with an unobscured view of the setting sun and the sloshing of the ocean all around us. There are a handful of experiences in my life that has given me that feeling of being ‘truly alive’ and I have now added this sunset cruise to that list! At a reasonable R300 per adult and R150 for children my advice to you is – do whatever you can, save all year if you must, but without a doubt, do this trip! It will make you so proud to be in Cape Town, the beauty will fill you with awe, you will relax with the fun and friendly atmosphere and best of all you will have that romantic moment to connect with your loved one. Kids are welcome but with this one I would say keep it for date night or a special occasion -you won’t regret it! Book at www.cruiseiq.co.za. The next day was more family oriented. 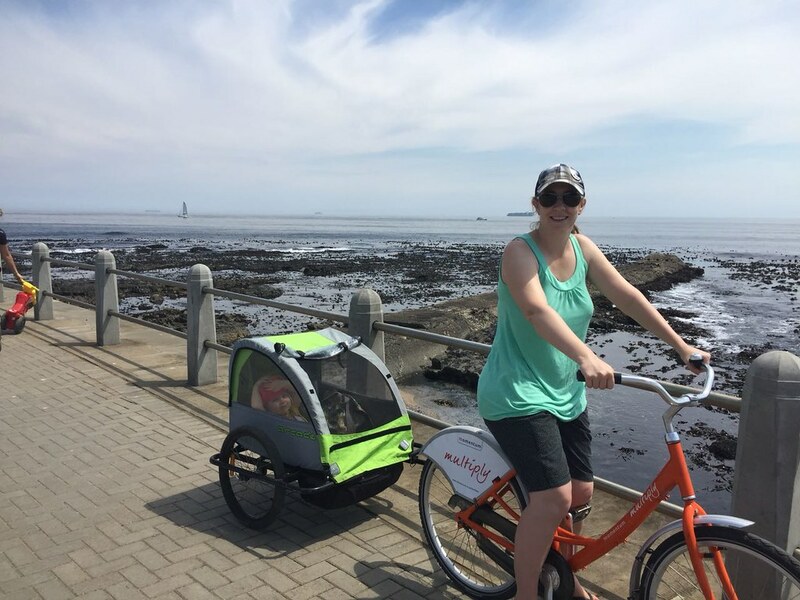 We took our daughter and baby boy for a cycle on the Seapoint promenade. It is a hassle-free experience as you rent bikes from a stand situated next to the public swimming pool at the start of the promenade. It costs R70 an hour, child seats are R60 and child carriages are R90. which made everyone happy. Cycling next to the ocean with the salty sea air in your lungs, watching the paraglyders landing all around you and looking at the crisp mountain views is incredible. There is also something to be said for being part of the morning crowd that gathers on the promenade to walk/cycle/run. It gives me a sense of being immersed in, and part of our City. 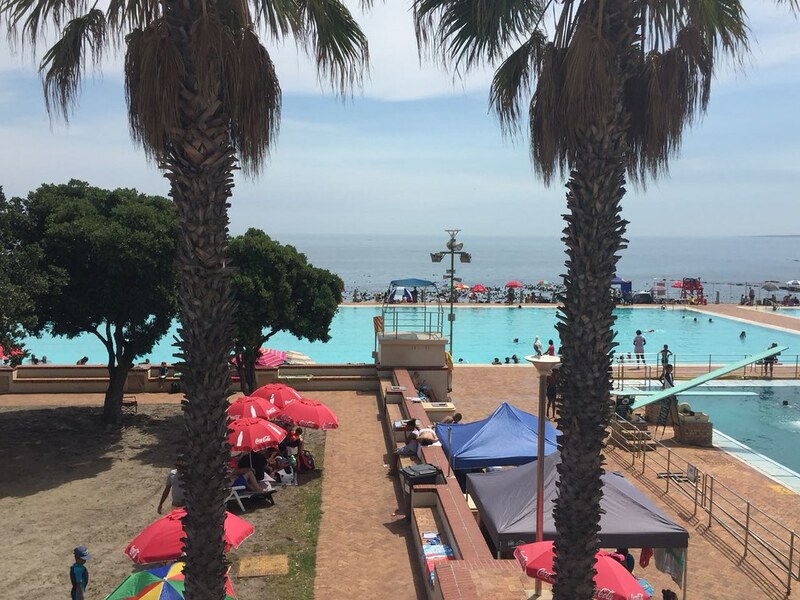 After working up a sweat, we had a quick dip in the Seapoint public pool. There is a large Olympic size swimming pool, a diving pool, a smaller medium depth pool and finally a toddler pool that is less than knee-depth. Our kids love it there! The pool directly borders the ocean, which makes for unique poolside views. The pool is filled with seawater so is not affected by the current water restrictions. Costs are R23pp for adults and R12pp for children, which is very affordable. 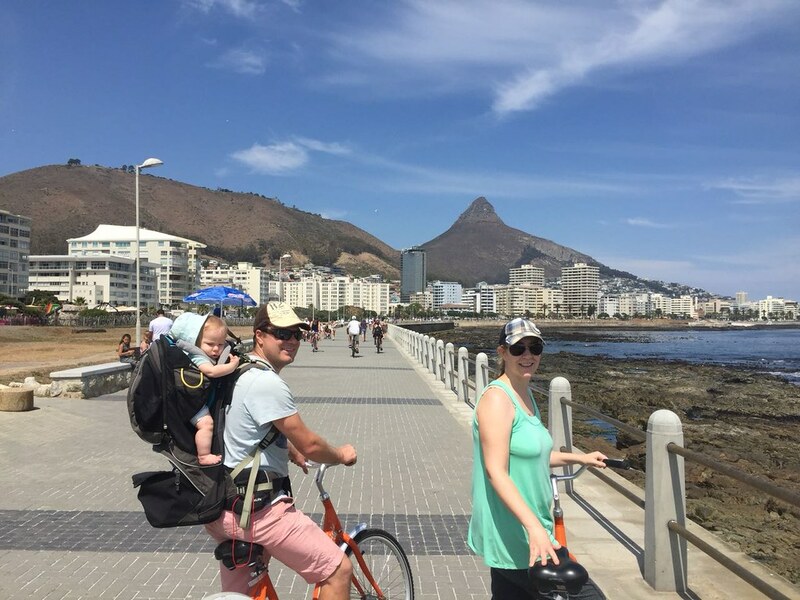 Make sure you get out there with your family and enjoy these and other activities as suggested on the Love My Cape Town website. Our city is one of the greatest in the world, with good reason! Previous ArticleLanzerac: A Valentine’s Day, must do! !